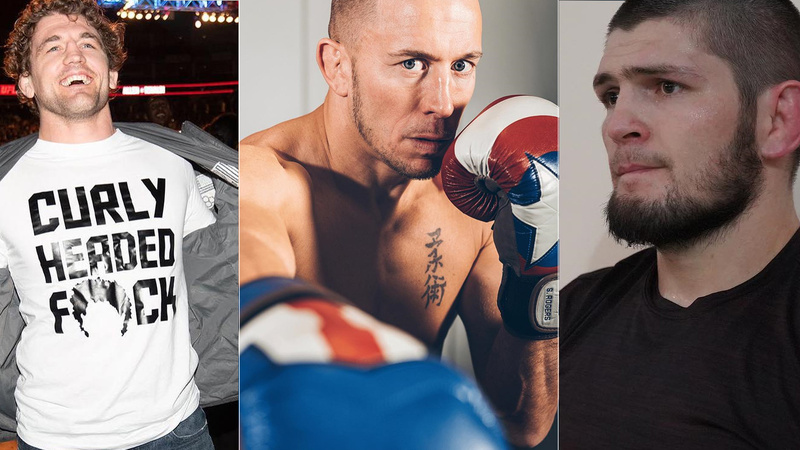 The argument is real here as who’s the best grappler between Khabib Nurmagomedov and Georges St Pierre well it’s hard to predicate as both are the greatest of all time. But an interesting question here is who’d win if they had fought in the past? St-Pierre was lobbying for a super fight against Khabib Nurmagomedov however the talks failed to come to fruition, and shortly after he officially hung up his gloves for good. Former Bellator MMA and ONE FC champion Ben Askren speaking with former title challenger turned commentator Dan Hardy in a recent interview, where he compared both Khabib and St-Pierre’s wrestling styles. ‘Funky’ thinks GSP’s hand would have raised had these two talented wrestlers fought inside the Octagon, but it’d be one hell of a tough fight. Since that super fight never happened, Askren still wondering how Rush would have retaliated to Khabib’s wrestling. Well, it’s unfortunate that we couldn’t be able to see these two great’s to throw down inside the Octagon, as MMA Gods are evil. Khabib is currently serving his UFC 229 post-fight brawl suspension, but rumors are that upon his return he’d take on the winner of Max Holloway vs. Dustin Poirier. Meanwhile, GSP is enjoying his retirement, and Ben Askren has verbally agreed to fight with Jorge Masvidal at UFC 239. Do you agree with Askren that GSP would have beat Khabib? Next articleVideo: Did Mystic Brendan Schaub predict T.J. Dillashaw’s EPO bust?